I meant to post these pics ages ago, but completely forgot to do so. I painted this Foundry gun and crew over a couple of days in August. The sculpts are by the Perries, but in their former Foundry style and are quite different to the figures they produce today. The poses are typically imaginative and the faces are full of character, but the figures' proportions are a bit "gnome-like" in the way that infuriates some wargamers. To be honest I found these figures fun and easy to paint, but it will be interesting to compare them to some of the newer artillery packs from Perry Miniatures. The crew pack comes with a few implements and the covered barrel and pile of cannonballs you can see in the photos - I suspect these may be more 17th century rather than 18th century. I detached 2 figures onto separate bases as I like to have 4 figures per crew for medium sized guns. As for the paints used, I wanted to have a darker blue for the artillerymen's uniforms than I've used for the line infantry. 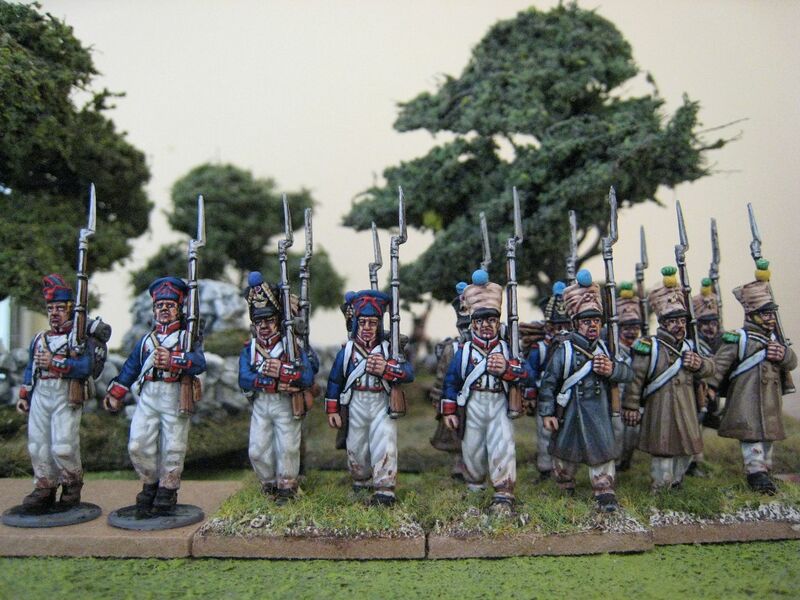 For troops such as light infantry and the artillery where both jackets and trousers are dark blue I have decided to use a more "realistic" dark French blue colour than the deliberately lightened blue I used on line infantry and cavalry. So I used the Foundry "French Blue 65" and then mixed in some "Deep Blue 20" for final highlights. The gun itself was painted with the Foundry "authentic" "French Gun Olive Green 109". I'm not convinced, personally - it looks far too "apple-y" and not sufficiently "olive-y". It's certailny nothing like the old Humbrol authentic colour for French artillery, which really was a green ochre colour. I may need to find something else for next time, or not bother with the "C" highlight. 6 figures and a gun. Painted August 2010. I had intended to move onto some more Carlist Wars figures, but having made inroads into my plastic infantry pile I thought it only right to open one of the cavalry boxes that I picked up at Salute in April. I painted up two cuirassiers to see how they'd look, then started on 4 more....now I have 8 being based and I'm hoping to have the 7th Cuirassiers finished by the end of the month (16 figures). 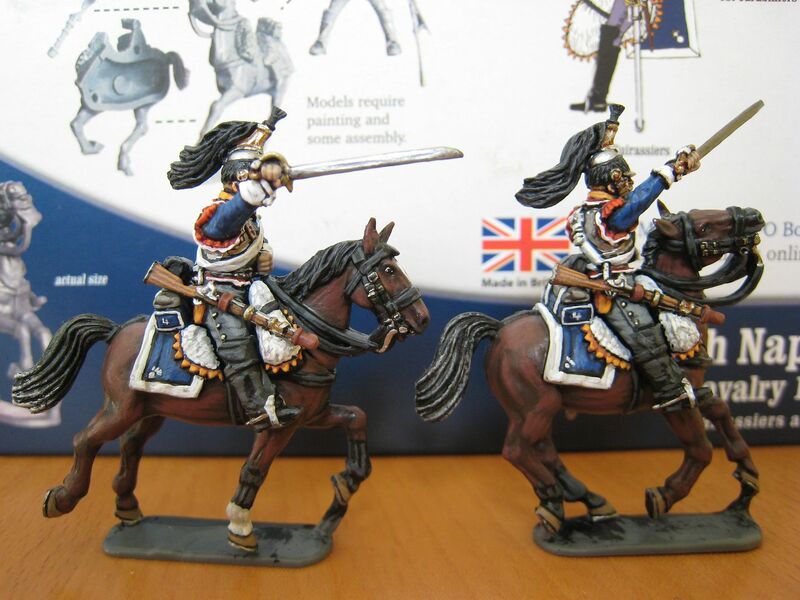 And so to Perry Miniatures' plastic cuirassiers. Having been accused by some of being a "Perry this, Perry that fan-boy", I shall try to give an honest opinion of these figures. The horses come in two halves and so you can create several different poses, although the joins are not always exact and you may well need some putty to fill them in. Presumably as a result of the moulding process, some of the horses have plastic ridges between the ears - you can of course carve this out but it's quite fiddly to do so without breaking off the ears (I stopped bothering after almost doing exactly that). It has been noted that the horses look a bit small compared to the riders. 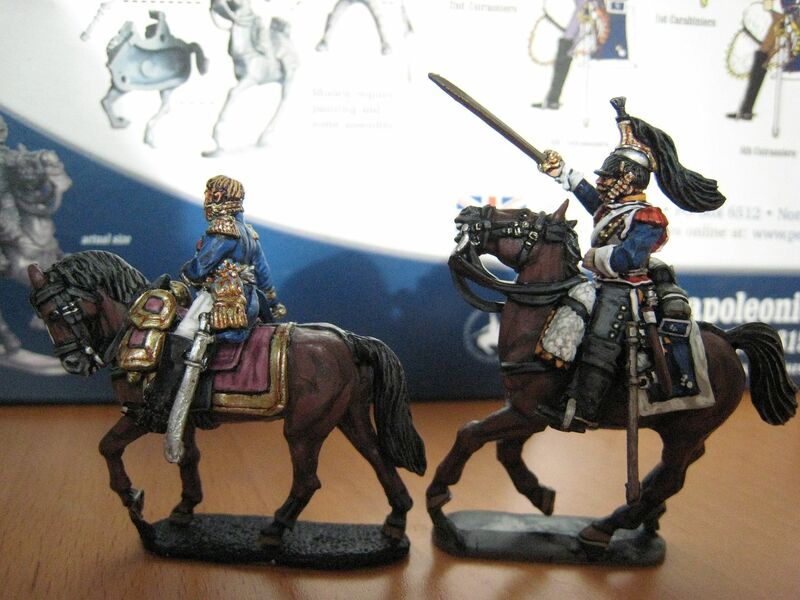 Then again, they are bigger than some of the other Perry metal figures - see the photo of a cuirassier behind General Campi below - and match the metal cuirassiers well. The riders are nicely sculpted, with a choice of "swords shouldered" or "swords at charge". Their carbines and scabbards are separate and attaching them to the figures is probably the most difficult part of the entire process (you have to use super-glue). Also, the painting sheet doesn't really help in showing you how to attach the carbine - it advises to attach it to the horse furniture rather than the trooper, but the only illustration of this on a real figure is very dark and it's hard to see how this works. I had to examine the metal figures, but their carbines are suspended rather differently. I've found that my preferred way of painting these figures is to paint the trooper and horse separately (as I would normally do) and glue them together afterwards. I painted my first 2 figures fully-assembled and I found it a nightmare to reach all parts of the figures. Another painting problem is that mould-lines run straight down the middle of a couple of the troopers' heads, which results in a lack of definition and makes they hard to paint (and I haven't yet made up my mind whether to paint the eyes or leave them in shadow; I've tried both and am not satisfied with either). A further gripe is the plastic "unit bases" - you get a mix of 1-, 2- and 3-figure bases which make it pretty much impossible to base an entire box either on Warhammer-esque individual bases or on larger-scale unit bases - I've based this 16-figure unit by empl0ying the four 3-figure bases and the two 2-figure bases, but I can see how the bases supplied won't work for everyone. In summary, I have found these figures tricky to put together and paint, but I'm hoping they will look good en masse. 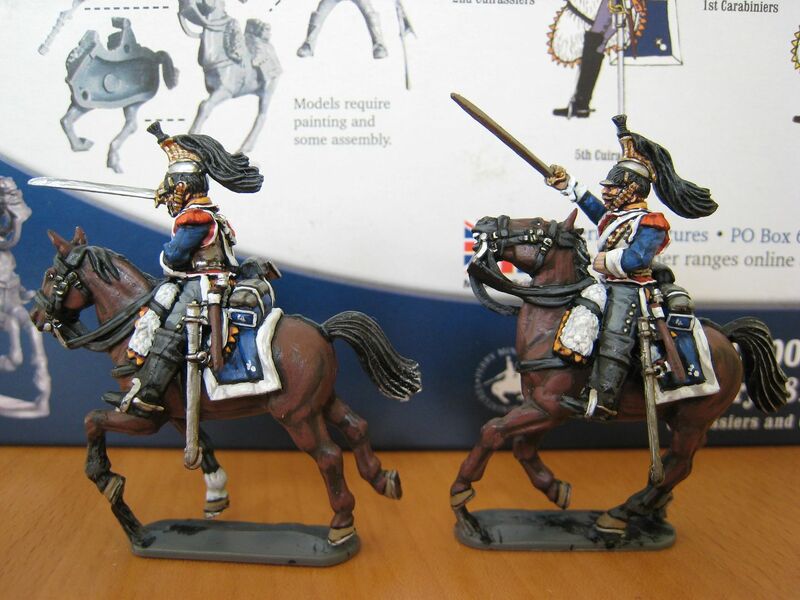 The cost is certainly an important factor in going plastic for Napoleonic cavalry, and I suspect the problems identified above will largely disappear with practice, once I work out how to deal with them. Also below is a wip shot of the 61st Ligne's first battalion, well on the way to completion. Once the cuirassiers are finished it's back to the AWI!